Fond of watching concerts? Did you try to save up to buy tickets for your favorite band? 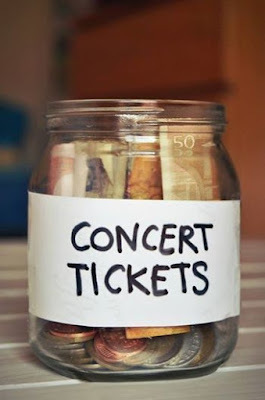 If you’re into 52-week money challenge, here’s something that you can fulfill your concert junkie dream come true! I’ve been covering concerts for the last 3 years. I observed that a lot of concertgoers ages 16 years old and above. Some of them lining up several hours before the ticket selling starts. Camping out outside the mall is one of the strategies that I’ve seen posted by fangirls and fanboys, mostly teenagers just to get the best spot for the concert. Here are some tips for concert junkies out there on how to save it up for the next concert night with your friends. 2. If you’re a member of a street team, some of them allowed to reserve tickets prior the ticket selling. It’s practical for those who frequently watch concerts. Also, they have time to save money. If you’re lucky enough to join contests, some of the sponsors for a particular concert and local radio stations conducted an online contest. One tip: Be creative for your entry. I’ve done this when a local telephone company did a Twitter contest for JLo Live in Manila in 2012. If not, better luck next time. Some of my friends rely on their credit card whenever their favorite singers and bands announce a tour here in our country. There’s one incident that a friend of mine canceled her online subscriptions and lessen splurging nonsense stuff. What she did is to save her daily expenses and accepts social media projects just to see her favorite band. Don’t forget to follow GoBear for financial tips!